Birchall's Cliff: "If you seek his memorial, look around you". Tax the rich! 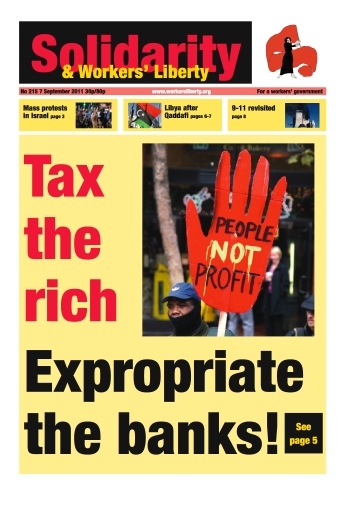 Expropriate the banks! 1968, 1989...2011? Is this a year of global revolt? Israel: "the welfare state is coming"
The eviction by Basildon council of 90 Traveller families from their homes at Dale Farm in Essex is set for Monday 19 September. Since the High Court ruled that the eviction could go ahead, the Travellers and their supporters have been making plans to resist it. Over the weekend of 27-28 August more than 100 supporters visited Camp Constant, a base for human rights monitors and those who will engage in civil disobedience to stop the bulldozing. They discussed the campaign against eviction and learnt about Traveller and Gypsy history and culture. The National Union of Teachers Executive should soon name a date for a second strike against government pension cuts, probably early November. On 6 and 7 September a revised Health and Social Care Bill has its third reading in Parliament amid talk of a backbench Lib Dem rebellion and leaked documents outlining the Tories’ secret plans to sell off hospitals to multinational corporations. Under political pressure last April, the Tories postponed the third reading for a “listening exercise”. But the bill has come back with little substantive change. A meeting of Unison members at Plymouth City Council on Wednesday 24 August voted unanimously (with just one abstention) to call for a strike ballot unless the council reverses its decision to de-recognise Unison. Messages of support for the campaign against union busting have been flooding in from as far afield as New York, including from the Communication Workers of America, notable for its recent battle with telecoms giant Verizon. The long-simmering issue of political party funding will come to the boil in October, when the Committee on Standards in Public Life (CSPL, a sort of quango, set up in 1994, with members appointed by the Government and the three big parties) reports. The Guardian of 30 August claimed that the CSPL has “agreed to recommend a new limit on donations, introducing an annual cap with figures ranging from £50,000 to £10,000 being considered”. The recent wave of cleaners’ militancy in London is continuing, winning a new victory at Senate House in Bloomsbury. The win follows successes at Heron Tower near Liverpool Street and Guildhall (where workers have been organised by the syndicalist Industrial Workers of the World). Unison members employed by the Scottish charity Quarriers struck for 24 hours on 6 September in opposition to plans to impose brutal pay cuts. Quarriers provides support for some of the most vulnerable and distressed adults and children in Scotland, including adults with disabilities and epilepsy sufferers. Over 560 of its employees are now at risk of a 10% pay cut. Others stand to lose as much as 23%. The Scottish TUC has called an all-Scotland anti-cuts demonstration for Saturday 1 October, in Glasgow. After the summer lull following the TUC demonstration in London in March and the public sector strikes at the end of June, the demonstration provides a welcome focus to re-vitalise anti-cuts campaigning. The demonstration will also be taking place in what could prove to be the run-up to widespread strike action in November, possibly involving the PCS and the EIS (the Scottish teachers union), which recently agreed to ballot its members on the issue of pensions. Kate Ahrens, a health worker and shop steward in the Leicestershire Health branch of the public sector union Unison, spoke to Solidarity in a personal capacity about the issues facing health workers. Working in the health service, it’s easy to think that everyone is as aware as we are of the huge threat posed by the Health Bill and the ongoing cuts and attacks on the service. But I suspect that the wider public have very little idea of what is coming their way.